The NFL released the 2019 schedule, the draft is a week away, and the AAF is officially bankrupt! Get all the Football talk you can handle on this very special episode! Coin Toss: Is the Browns schedule manageable enough to make the playoffs? Targeting: Breaking down Vince’s final mock draft. No Huddle: New CFL rule ideas, the AAF files for bankruptcy, picking the best games in primetime. The Spring League has wrapped up in Texas and as the league was testing we learned a ton about potential rules that will be included in the coming league rule book, including the much talked about overtime “shootout.” This week we react to our chat with Doug Whaley and Justin King of XFL Football Operations as well as some of what Oliver Luck said during the week as he made his media rounds. Also get the latest rumors on the XFL TV deal, a discussion on player tracking technology the league tested at The Spring League, and a look ahead at next week’s introduction of the New York head coach/general manager and team president. Coin Toss: Should the Cardinals draft Kyler Murray? No Huddle: John Football, Chad Kelly, young bucks in the XFL, Gronk’s heir, and more! 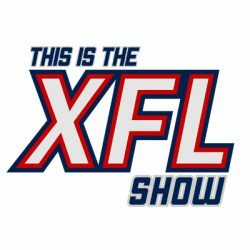 This week XFL Senior Vice President of Football Operations Doug Whaley and Manager of Football Operations Justin King join us for a conversation about everything being planned for the XFL’s on-field product. While Whaley, King, and their team are down in Texas testing and reimagining the game of Football at The Spring League, they take time to fill us in on all the new rules and ideas that could ultimately be implemented in the XFL come 2020! If you are a Football freak, you cannot miss this epic Football conversation with the brains behind the Football operation of the XFL! Follow this link to join our Patreon! Get even more content and bonus shows, plus subscriber perks! Give today and ride in style on the road to 2020 with maximum Football talk! This week’s show is solely focused on the AAF ceasing Football operations before finishing their inaugural season. With two more team presidents signing on, the start of The Spring League, and significant financial news coming out, it was a very busy week on the road to 2020! Are XFL team presidents more important hires than coaches? We debate! Plus, we examine how the XFL’s sound financial plan and quality hires for key roles sets itself apart from the failing AAF experiment. We are all business on this stop en route to 2020! Join us for some more good, crisp XFL talk! XFL L.A. is the first team to get a team president as Heather Brooks Karatz, formerly of the MLS’ LAFC, assumed the role of the head business person of the franchise. This week we take a look at what Karatz’ role entails and why the league gave L.A. a team president before a head coach. While business moves were made in the XFL this week, Football moves will be made when the league runs tests along with the coaches and players of The Spring League. As we get ready for all of the information to come out of The Spring League in Austin, TX, this week features a lengthy conversation on players, data, and rules to key on throughout this scouting bonanza. The XFL took the week off from announcing another head coach/general manager, but that doesn’t mean there isn’t plenty to talk about! With NFL free agency dominating the news this week, it is time to take a look at some potential Tier 1 QBs that the XFL could be targeting. We also get even deeper into the details within the research and development of new rules that are being tested at Your Call Football and The Spring League! Join us for some more good, crisp Football talk on the road to 2020!